In 1983, Bob Funk founded Express Employment Professionals, establishing its headquarters in Oklahoma City. As CEO and chairman, Funk leads the company with more than $3 billion in sales, 780 franchises, and employs more than 510,000 people annually in the United States, Canada, and South Africa. Born in Duvall, Washington, Funk graduated from Seattle Pacific University and completed his graduate studies at the University of Edinburgh, Scotland. He holds honorary doctorate degrees from Seattle Pacific University, Oklahoma Baptist University, and Southern Nazarene University. His success in staffing has afforded Funk the opportunity to enjoy his other passions: the nationally renowned Express Ranches and the world and national champion Express Clydesdales. He was named Most Admired CEO by The Journal Record, Man of the Year by Impact OKC Magazine, and inducted into the International Franchise Association Hall of Fame and the Sales and Marketing Executives International Hall of Fame. 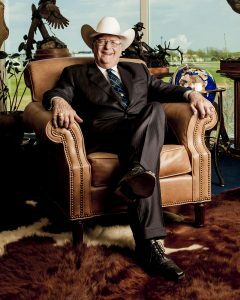 Having lived in Oklahoma for over 50 years, Funk passionately supports the community, both financially and through service on boards, including serving as chairman of the OKC Chamber of Commerce, National Cowboy and Western Heritage Museum, and the Oklahoma Youth Expo. He has served nationally as chairman of the Chairmen of The Federal Reserve Bank and the Kansas City Federal Reserve Bank, and currently sits on the boards of the American Staffing Association, FFA, and several banks. See pictures of Bob Funk and other media HERE.